If you want quality chimney cleaning for your fireplace, then look no further than Creative Masonry & Chimney. Our extensive experience ensures that even the blackest and most soot-ridden fireplace will be cleaned post-haste. Feel free to call us and schedule a meeting about how best to tackle the situation. When it comes to cleaning fireplaces, we know how best to handle it thanks to our veteran experience in the field of fireplace sweep services. Creosote is an oily substance that accumulates on your chimney and fireplace because it is a by-product of coal or wood burning. It’s a chemical that is transferred by the heat of the fire and accumulates as fatty deposits along the insides of your chimney. A cleaning brush generally isn’t enough to remove creosote. If you were to try to remove it yourself, you’d quickly see that fireplace cleaning and sweeping is not a do-it-yourself type of job. On top of being a fire hazard, it could even be a health hazard that can cause you lung problems. You could also potentially damage your chimney or fireplace, resulting in a need for repairs. Leave it to the professionals at Creative Masonry & Chimney to get the job done! Soot removal is another service that happens to be right up our alley for our professionals specializing in chimney cleaning services. This thick, black dust cakes on your fireplace and chimney and takes up most of our cleaning efforts and time because it’s the most common and immediate by-product of coal or wood burning. Beware of dust! You may have a black cloud of soot in the air and not even know it. This is a fine custodian art that should not be underestimated. If you want to have a gander at what true fireplace and chimney cleaning entails, give us a call. We cover all of our bases. We’ll increase the efficiency of your fireplace and other heat sources. After we’re done with your chimney, you can be sure that the safety of your fireplace will be improved as well. This is because the dirtier your fireplace becomes, the more of a fire hazard it is, so you need the professional help of fireplace sweep services to avoid that particular danger. An unclean fireplace can also be a source of pollution. Not all chimney sweep companies are created equal, and you need a premium-grade service. Cheaper isn’t necessarily better when talking about safety. While our current regular price is only $199.99, it falls well within the average cost of a chimney sweep ($169-$219). We stack up really well against our competitors when it comes to our fireplace service. When we get to your house, we lay down drop cloths from the front door to the fireplace work area. Next, we bring in a HEPA vacuum with three levels of filtration and super suction to keep the area dust-free. After we are set up, we remove the fireplace damper and sweep the fireplace flue, smoke shelf, and smoke chamber with a carefully chosen wire brush. The firebox is also brushed down. All this is done while our 3-motor, HEPA filter vac is continuously running. The next step is to inspect your fireplace for your safety and reinstall the damper. The average time to sweep a fireplace is usually around an hour. Contact us today to get started. Chimney sweeps have been working in homes and business locations for hundreds of years, and we here at Creative Masonry & Chimney uphold that tradition by using tried-and-true chimney-sweeping tactics and techniques perfected by decades of professional chimney cleaning experience. If you want your immediate environment to be clean and clear of potential respiratory threats (this is especially true if you have allergies), then it’s imperative that you call a chimney sweeping company such as ours. We have all the tools and training necessary to remove your fireplace blockages in a snap, from the standard special brush with metal bristles to other, more advanced chimney cleaning tools that ensure the efficiency of your chimney for many, many years to come. It’s essential that creosote and soot are removed before too much accumulates in your chimney because they are flammable substances. Even small sparks can ignite the grease accumulation within your chimney. 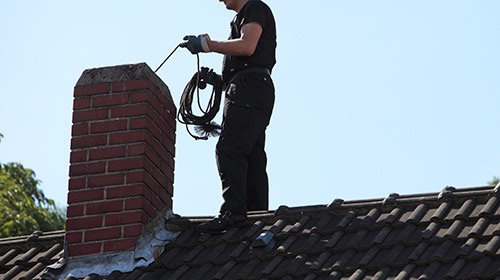 For your convenience, we provide professional chimney services year-round. Spend your money once, and spend it smart. Come visit our showroom at 1451 New Britain Ave. in Farmington or call today at (860) 225-9178.